Damn, turns out that was us! I got a text from our niece Catherine saying they were having a party and would we like to come? 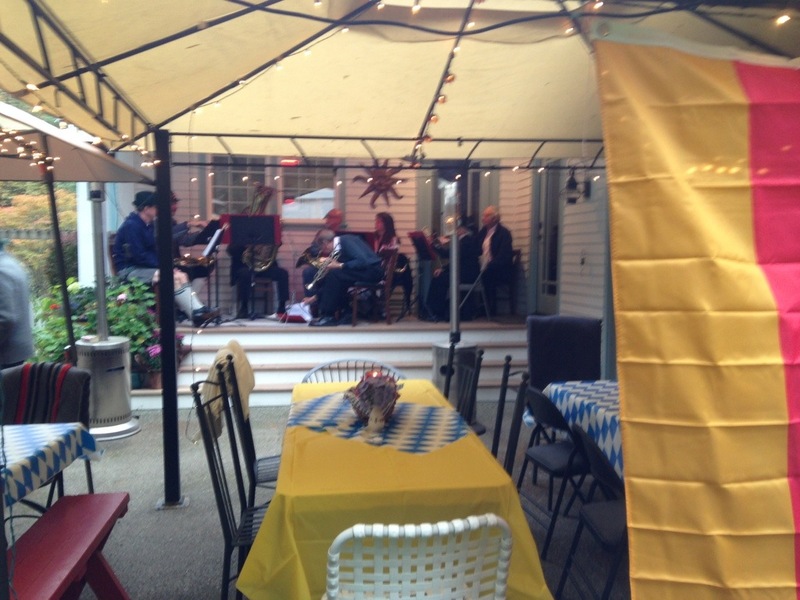 A little prodding and I was able to determine that the party was for Oktoberfest, it began at 5pm and no costumes were required. I only asked about the dress attire because my sister-in-law is part-German and a young Catherine had previously shown up for no less than three Christmas dinners wearing her genuine dirndl given to her by her grandparents. 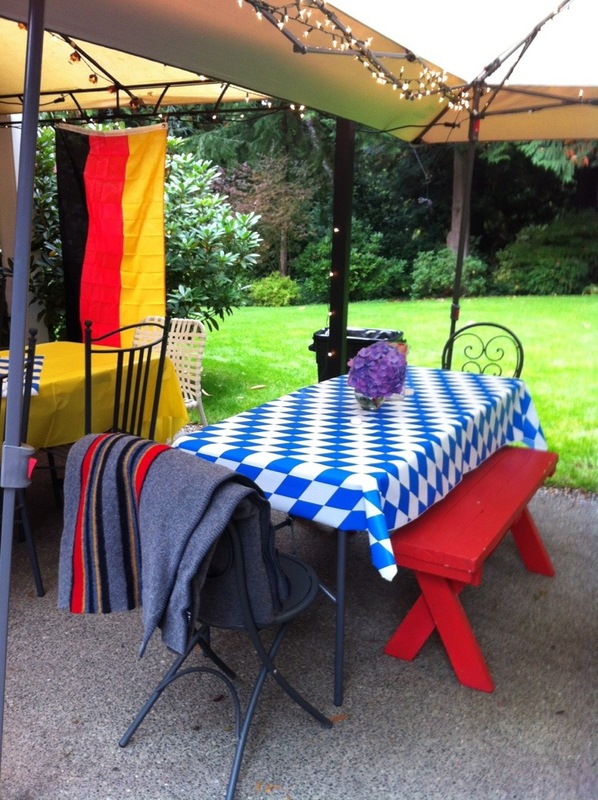 A little further prodding revealed that there might actually be dirndl and lederhosen afoot, but neighbor/friend Joe G. would indeed be manning the grill. Not sure where to start with that story other than to say, Joe cooks, we’re there (boat dependent). Plus, Grandma Doris bakes a mean tart (amongst other things) and we hadn’t seen everyone since her birthday in April. Seeing that the message reached us at 2pm that afternoon and required catching a ferry… We procrastinated a little, then a little more because that’s how we (not quite) roll! Late as usual, we quickly packed up the pups and ourselves without the usual fuss. Fussing that always lands us in the back of the line at the ferry terminal; or the front after missing our boat. We are notorious for missing the boat, in more ways than one. We weren’t sure what to expect but were excited to see our family and friends! My niece had the start time wrong though; turns out the party actually began at 4 o’clock, which rendered our 6:15pm arrival – officially late for dinner. Sauerbraten may have been gone but there was no going hungry that night! Joe had made an enormous amount of home-made sauerkraut with the perfect balance of savory to sweet; unstoppable next to his grilled wurst. Doris had not made her German potato salad that is always just right, but made a just-right onion tart instead. Being a particularly avid fan of her apple tart, Tom was quite pleased with the state of affairs regarding the dessert table, but (different subject) not before polishing off 2, maybe 3 of the soft pretzels that he was not shy about rolling extras of into his wadded napkin to enjoy the next day. So, although we didn’t anticipate an outdoor party since you’ve been able to cut the fog with a knife lately, and should have used some more fuss time layering up, there was good company, good food, a keg of (obviously cold) beer (although maybe not as cold as our toes), an outstanding live Oom-pah band, and a good time on a crisp evening in October. Tom did get to enjoy his soft pretzel the next day, wadded napkin removed. I even treated it to a hot sauna and a dip in his favorite cheese sauce that I developed the last time he requested cheese whiz (with the usual reference to the Blues Brothers). Looking forward to next year (with more wool)! My sister-in-law, Christine, bought a case of soft pretzels from Town and Country Market on Bainbridge. If you live in the greater Seattle area, Essential Bakery makes a very good one (you can pick up their baked goods at many places around town, I suspect that’s where the T&C ones were from). But I especially like the ones at Tall Grass Bakery in Ballard, I stop in there when the 8 legs get their fuzz cut nearby (more on that later, because we don’t live anywhere near). Place the soft pretzels on a baking tin and BRUSH with warm WATER. SPRINKLE with SEA SALT and place in oven for about 5 minutes. I like to use individual ramekins for this because it is usually just a quick snack and this makes it easy to keep to a single size. You could use the same logic in larger quantities using a saucepan over the stove. A double boiler would work really well to keep the cheese from solidifying. Using a good-quality cheddar, crumble or shred the cheese into the ramekins filling no more than 1/2 way. Put a dollop of Dijon mustard in (TB size dollop if you want a stronger mustard flavor and on down to a 1/2 tsp if you prefer it less tangy). Dribble in a little white wine or, better yet, white vermouth (there isn’t a lot of room left so that determines how big your dribble can be). Now you have a few choices, either put it in the oven to melt, same time as the pretzels, or put in the microwave for approximately 20 seconds. Stir or whisk (if you have a tiny whisk) until creamy. 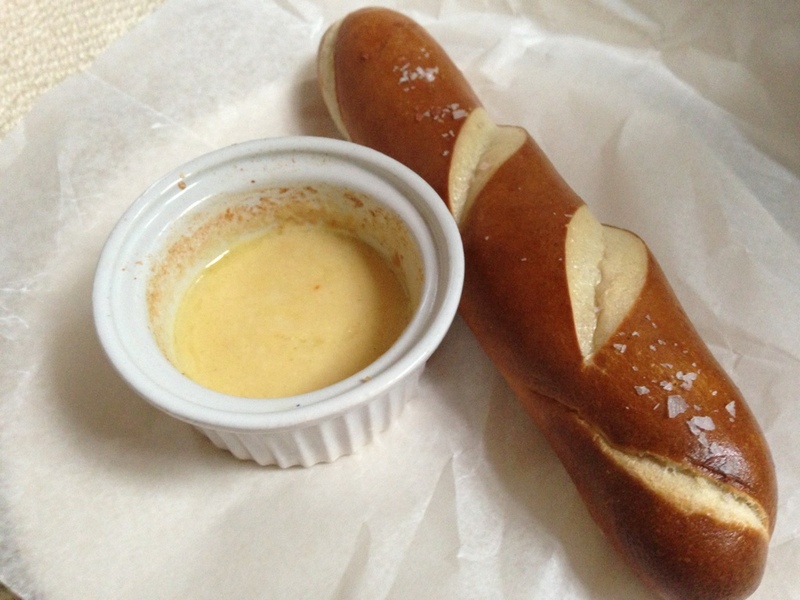 You can add a little bit of water or wine, drops at a time, to help with the consistency, and put back to the oven or microwave to be sure it is nice and toasty when you dip in your pretzel. Now if you have a beer, crack it open; it helps to wash this down. If not, pop open some ginger ale and break into the game closet. Prost! 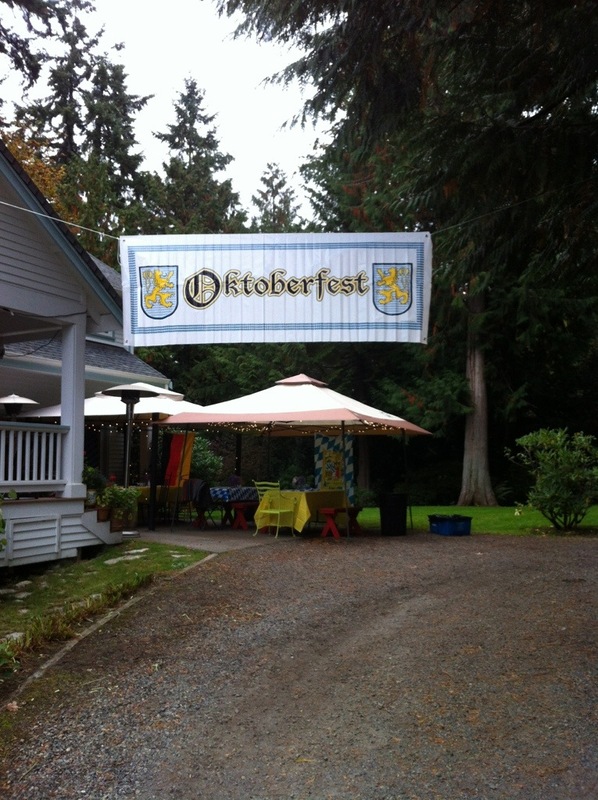 So here it is, that time of year again – Oktoberfest! I posted this three years ago and am wanting to let all of you out there know that it is our mission, this year, not to be the last one to the party! We are layering up and heading for the ferry, beer mug in hand! See you on the other side. I am also going to raise a glass for my niece Catherine, who is studying abroad in Copenhagen this year. Prost!